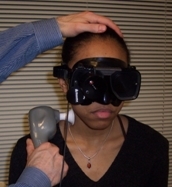 The vibration test is a recent development in clinical vestibular assessment. It has been made possible by the wide availability of video Frenzel goggles, which are devices which allow one to observe a subjects eyes in complete darkness. Vibration over the head or neck may elicit a vigorous nystagmus, and furthermore, the nystagmus is frequently direction specific and allows you to identify the "bad ear" (it beats away). We will sometimes use the abbreviation "VIN" for vibration induced nystagmus. Device used for vibration test (cost -- about $25). This is a Sunbeam/Oster shower massager. A source of vibration, such as a hand-held shower massager is firmly applied to the mastoid, anterior or posterior neck of a subject. Others have used a "TheraSpa Turbo Brookstone" (White et al, 2007) You can use other vibrators instead -- it is not very critical except we advise against battery powered devices (which vary according to their charge status). The other device that you need is a video-frenzel goggle system. In the past, simple systems produced a composite signal that could be directly observed on a TV monitor. Recently, the composite devices have largely been replaced by "firewire" devices, that require a PC. This is unfortunate. Optical Frenzel goggles just don't work for this test -- you need complete darkness. Method of vibration test. A shower massager is applied firmly to the lower edge of the sternocleidomastoid. The lower frequency setting is used (60 hz). Generally we apply vibration to the lower edge of the sternocleidomastoid as we want to avoid the carotid artery area, but the exact location is not at all critical as long as the sternocleidomastoid is located and the pressure is firm. The eyes are observed with a device such as a video-Frenzel goggle system. No light can be allowed. The subject is sitting upright, without instruction other than to look straight ahead. Vibration induced nystagmus. This patient has a 60% left weakness. There is a 3 deg/sec right-beating spontaneous nystagmus, which increases to about 10 deg/sec when vibration is applied to either sternocleidomastoid with a device that produces a 60 cycle pulse (a shower massager). A positive response is a horizontal nystagmus that beats in the same direction, for vibration on both sides of the neck. Above is shown a strong nystagmus, typical of vestibular neuritis or post-ITG. It is actually more common to have no spontaneous nystagmus at all, but a powerful nystagmus produced by vibration. This would be typical of the compensated unilateral loss. Another example of the typical positive vibration test is shown here (movie, 7 meg). This individual has a complete unilateral vestibular loss secondary to removal of an acoustic neuroma on the right side 30 years prior. There is a strong nystagmus beating to the left, for vibration on either side. The subject cannot see because of the goggles which occlude vision. The vibration source is a conventional shower massager as shown above. This example illustrates that vibration induced nystagmus generally persists as long as the unilateral loss persists. In acoustic neuroma patients -- this means forever. It is common for vibration to produce a nystagmus that beats to the left for vibration of the left neck, and to the right on vibration of the right neck. This is an "ipsi" versive DCVN. This response seems to be more frequent in older people, and has no association with any known disease. Perhaps it relates greater reliance on the neck in older people, as their ears degrade. Occasionally (perhaps 1% of the iDCVN), there is a contraversive nystagmus that beats opposite to the side being vibrated. cDVCN. Again, there is no clinical correlation as yet. This link is to a video of a weak cDCVN (courtesy of Dr. Dario Yacovino). Occasionally there are large differences in the intensity of nystagmus between one side and the other. The clinical significance of this is unclear. We speculate that some of the asymmetry is due to technical issues (i.e. inconsistent application of the vibration), and that some of it is related to differences in neck proprioception. We think this is much more common in persons who have had neck surgery. 2 examples of upbeating nystagmus induced by vibration on either side. This is of unknown significance, but it is quite rare, unless very strong vibration is used. It may relate to where the source of vibration is placed on the head. Nystagmus that is vectored other than horizontally, is of unknown significance. Following the convention in ENG testing, this response can be called "perverted", because it goes in unconventional directions. In some cases it may be due to release from fixation suppression. This is generally upbeating, but downbeating and even torsional nystagmus is rarely encountered. In SCD, vertical nystagmus is occasionally reported (see below). In theory, unexpected VIN might be due to release of fixation -- perhaps neck input was suppressing a nystagmus. Also, entirely in theory, perhaps vertical VIN is due to a relative lack of upward or downward sensors in the inner ear, assuming that vibration stimulates everything. We don't really know. Here again is a link to vibration nystagmus in a patient whose acoustic was removed in the remote past. (movie, 7 meg). This individual has a complete unilateral vestibular loss secondary to removal of an acoustic neuroma on the right side 30 years prior. There is a strong nystagmus beating to the left, for vibration on either side. The subject cannot see because of the goggles which occlude vision. The vibration source is a conventional shower massager as shown above. Vibration over the posterior neck (suboccipital)-- this method has been reported useful in diagnosis of Superior Canal Dehiscence syndrome (White et al, 2007). These authors reported that a downbeating nystagmus is elicited. We have not found this to be true in our SCD population. We would not rely on this. Vibration over the mastoids. -- this location elicits nystagmus as well as the anterior neck, but due to bone conductionin the skull and proximity to the ear, might be less localizing as it stimulates more structures. More study is needed. Vibration over the posterior neck -- while a safe spot, this location seems to give more erratic directions of nystagmus. There is a suprisingly large literature documenting the utility of neck vibration in diagnosis of dizziness. There is also a large basic science literature documenting the deleterious effects of vibration on posture. Vibration of the neck is a moderately reliable method of localizing the side of a unilateral vestibular lesion. In complete darkness, vibration induces a nystagmus that resembles that seen acutely, prior to compensation. Vibration induced nystagmus persists over decades, unlike spontaneous nystagmus. Vibration testing was abnormal in generic vestibular neuritis in 91% of patients, and 94% of those patients with Ramsey-Hunt type of vestibular neuritis (Kim et al, 2015). Koo et al (2011) compared VIN to caloric and the time constant of the rotatory chair test. VIN was a better test than HSN or spontaneous nystagmus, althought hey were all rather similar. There was a weak (0.451) correlation with caloric paresis, and also a weak correlation with the time constant. One would not think that it would correlate that well with TC, as the TC does not reflect relative vestibular paresis, but can be affected by bilateral as well. On the other hand, one would expect a better correlation with canal paresis. We ourselves have found that vibration induced nystagmus is an excellent method of determining whether or not transtympanic gentamicin treatment for Meniere's disease will stop vertigo attacks. (unpublished data of the author). Presumably this is due to unilateral vestibular damage. We also use it when patients with Meniere's, who have had TTG, get worse. If there is no VIN -- perhaps more gentamicin is needed. This does not always work. Vibration to diagnose SCD -- dubious. Vibration of the posterior neck is reported to be useful in diagnosis of SCD, but we are dubious ourselves. According to White et al (2007), it induces a downbeating nystagmus (White et al, 2007). We have not found this to be true in our SCD population. On the other hand, Dumas et al (2014) suggested that vibration of the vertex of the skull largely produces an upbeating nystagmus. Which is it -- downbeating or upbeating ? In our own practice, we don't think that vibration of the neck (SCM) induces any consistent nystagmus in SCD, and in those who have upbeating nystagmus, most have BPPV and not SCD. So -- This observation is so far not well established, and we haven't found this to be true in our own patients either. In other words, don't depend on it. The valsalva test is far more effective in diagnosing SCD at the bedside. The oVEMP test is currently the best lab test to establish SCD, without doing a CT scan. Vibration of the mastoid in Meniere's disease - Hong et al (2007) suggested that vibration over the mastoid was somewhat localizing, generally producing contralesional nystagmus, especially in persons with more vestibular damage. There are many problems with this study - -mastoid location (see above), and also a protocol where the side eliciting bigger VIN was used. We prefer a protocol where only VIN is accepted that goes the same direction for each sides, and also a protocol where the neck rather than the mastoid is stimulated. Still, we do agree that occasionally a wrong-way VIN is seen. Does vibration induced nystagmus (VIN) interfere with navigation (i.e. does a military jeep driver with a dead ear go off course on bumpy dark roads ? What is the relative sensitivity of VIN and HSN as a function of canal paresis ? (We think HSN is best with about 50% canal paresis, and VIN scales more linearly with canal paresis). The "Koo" paper above addresses this to some extent. What is the frequency and amplitude dependence of VIN ? (We are unsure about frequency, we think more amplitude produces more nystagmus). What is the effect of neck surgery on VIN (we think it reduces it). Is VIN from the vibration of the ear or from the neck afferents (we think neck afferents). What is the meaning of upbeating VIN ? Betts GA, Barone M, Karlberg M, MacDougall H and Curthoys IS (2000). "Neck muscle vibration alters visually-perceived roll after unilateral vestibular loss." Neuroreport 11(12): 2659-62. Biguer B, Donaldson IM, Hein A and Jeannerod M (1988). "Neck muscle vibration modifies the representation of visual motion and direction in man." Brain 111 ( Pt 6): 1405-24. Bottini G, Karnath HO, Vallar G, Sterzi R, Frith CD, Frackowiak RS and Paulesu E (2001). "Cerebral representations for egocentric space: Functional-anatomical evidence from caloric vestibular stimulation and neck vibration." Brain 124(Pt 6): 1182-96. Bove M, Diverio M, Pozzo T and Schieppati M (2001). "Neck muscle vibration disrupts steering of locomotion." J Appl Physiol 91(2): 581-8. Dumas, G., et al. (2014). "Skull vibration-induced nystagmus test in unilateral superior canal dehiscence and otosclerosis: a vestibular Weber test." Acta Otolaryngol 134(6): 588-600. Gauthier GM, Roll JP, Hugon M and Martin B (1983). "Motor dyscontrol as a hazard in massive body vibration in man." Adv Neurol 39: 685-97. Gauthier GM, Roll JP, Martin B and Harlay F (1981). "Effects of whole-body vibrations on sensory motor system performance in man." Aviat Space Environ Med 52(8): 473-9. Hong, S. K., et al. (2007). "Implication of vibration induced nystagmus in Meniere's disease." Acta Otolaryngol Suppl(558): 128-131. Karlberg M, Aw ST, Black RA, Todd MJ, MacDougall HG and Halmagyi GM (2003). "Vibration-induced ocular torsion and nystagmus after unilateral vestibular deafferentation." Brain 126(Pt 4): 956-64. Kim CH1, Jeong KH2, Ahn SH2, Shin DH2, Kim YW2, Shin JE2 Vibration- and hyperventilation-induced nystagmus in patients with Ramsay Hunt syndrome with vertigo. .Otolaryngol Head Neck Surg. 2015 May;152(5):912-8. doi: 10.1177/0194599815570283. Epub 2015 Feb 11. Koo, J. W., et al. (2011). 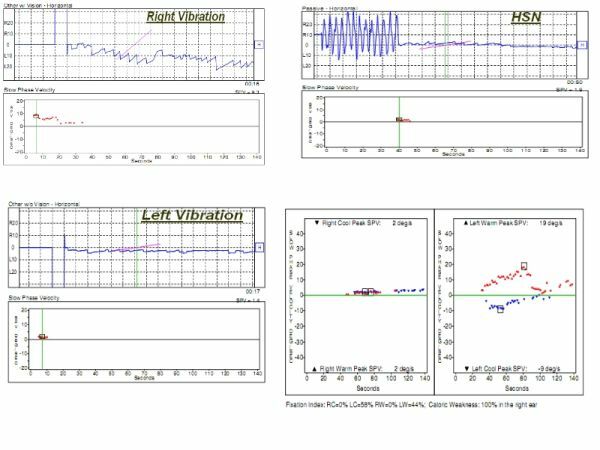 "Vibration-induced nystagmus after acute peripheral vestibular loss: comparative study with other vestibule-ocular reflex tests in the yaw plane." Otol Neurotol 32(3): 466-471. Lekhel H, Popov K, Bronstein A and Gresty M (1998). "Postural responses to vibration of neck muscles in patients with uni- and bilateral vestibular loss." Gait Posture 7(3): 228-236. Michel J, Dumas G, Lavieille JP and Charachon R (2001). "Diagnostic value of vibration-induced nystagmus obtained by combined vibratory stimulation applied to the Neck muscles and skull of 300 vertiginous patients." Rev Laryngol Otol Rhinol (Bord) 122(2): 89-94. Popov K, Lekhel H, Bronstein A and Gresty M (1996). "Postural responses to vibration of neck muscles in patients with unilateral vestibular lesions." Neurosci Lett 214(2-3): 202-4. Popov KE, Lekhel H, Faldon M, Bronstein AM and Gresty MA (1999). "Visual and oculomotor responses induced by neck vibration in normal subjects and labyrinthine-defective patients." Exp Brain Res 128(3): 343-52. Strupp M, Arbusow V, Borges Pereira C, Dieterich M and Brandt T (1999). "Subjective straight-ahead during neck muscle vibration: effects of ageing." Neuroreport 10(15): 3191-4. Strupp M, Arbusow V, Dieterich M, Sautier W and Brandt T (1998). "Perceptual and oculomotor effects of neck muscle vibration in vestibular neuritis. Ipsilateral somatosensory substitution of vestibular function." Brain 121 ( Pt 4): 677-85. Yagi T and Ohyama Y (1996). "Three-dimensional analysis of nystagmus induced by neck vibration." Acta Otolaryngol 116(2): 167-9. Yagi T, Yajima H, Sakuma A and Aihara Y (2000). "Influence of vibration to the neck, trunk and lower extremity muscles on equilibrium in normal subjects and patients with unilateral labyrinthine dysfunction." Acta Otolaryngol 120(2): 182-6.